"The man with the golden gun is ready to assassinate James Bond.". A golden bullet has 007 engraved on it as it smashes into the secret service headquarters. 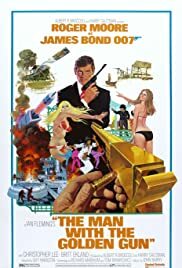 The bullet came from the professional killer Scaramanga who has yet to miss a target and James Bond begins a mission to try and stop him.